Most businesses fail due to a lack of preparation for the inevitable. Below are three major reasons your small business needs an emergency fund. The most important thing an emergency fund does is it provides immediate access to funds during critical times. And while you may be insured against product loss, property damage, and equipment repairs, the time it takes to process those claims and get your hands on the necessary cash could be detrimental. And insurance may not cover every eventuality. An emergency fund allows you to continue operating and immediately begin making repairs and replacing any lost, damaged, or stolen products. The saying, "Time is money" applies in business, and having extra funds on hand could be the one thing that keeps you on the favorable side of those business statistics. A staggering 82 percent of businesses that fail do so because of issues with cash flow. Cash flow doesn't just mean the flow of money that is coming in and out. It also encompasses timing and liquidity. For example, if your business operates on an invoicing system and invoices aren't paid or are paid late — after your loans and other payments are due — you could run into a cash flow problem. This is extremely important if you operate a seasonal or cyclical business. Another extremely important purpose of having cash on hand for emergencies is to capitalize on business opportunities. Liquidity supports agility. The idea of stashing thousands of dollars in a savings account for the off chance that it may come in handy at some point in the future may seem a bit impractical. Yet there is one guarantee in business — it is going to rain. And the storm is going to impact your cash flow. While the thought of amassing thousands of dollars can be stressful, you can't let it stop you. Having an emergency fund is nonnegotiable. Establishing your retained earnings or emergency fund is very similar to the personal finance process. You set your goal, and throw every extra dollar at it until you reach it. It's a good idea to set up an automated savings plan so that your emergency fund contributions are made before you have a chance to count them as profit. It should be a regular line item in your budget. It's also important to regularly prepare and analyze cash flow statements to ensure you have a clear picture of where you are at all times. Hiring a bookkeeper, using cloud-based software such as QuickBooks, or staffing a Certified Public Accountant (CPA) are great ways to help keep a handle on your cash flow. 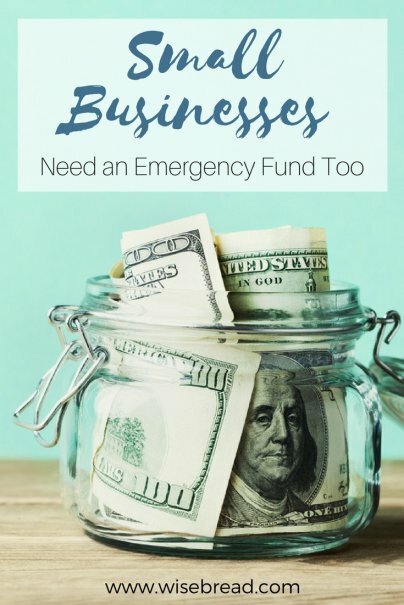 Much like a personal emergency fund, businesses should have anywhere between three months' and a year's worth of expenses set aside for emergencies. The specific amount your business needs will depend on your unique circumstances such as your expenses and the reliability of your income sources. You also must consider other aspects of your company that could affect cash flow, such as the type of business and that industry's culture. Some industries are more susceptible to lawsuits and legal actions. If you operate a medical practice or a financial consulting firm for example, you will probably need a larger emergency fund than someone who runs a graphic design business. Once you've decided how much you'd like to save, you need a place to put it. These funds are not meant to ride the stock market or earn very much in interest. The goal is for the money to be there, liquid, and available when you need it. As you embark on your journey of grounding and fortifying your business by establishing a solid emergency fund, remember to start off small. Set short, realistic goals and remain steadfast. Look for ways to lower expenses and save more during high volume seasons. Be frugal and stay away from risky deals until you have reached your emergency fund goal.